Jamba, Inc. (Nasdaq: JMBA), a leading lifestyle brand whose mission is to inspire and simplify healthy living, debuts two watermelon smoothies, the Poolside Fit™ pre-boosted with collagen and the Watermelon Breeze™. Jamba continues to pioneer in the beverage category with the introduction of collagen to their boost menu. Collagen, a protein with many benefits, is most commonly promoted for its ability to produce glowing skin and healthy joints. Widely known as a cosmetic supplement in the beauty industry, collagen use is now trending as a consumable supplement. Watermelon, the primary ingredient in both summer smoothies, is a rich source of the antioxidant lycopene, which helps prevent cell damage and aids in ridding the body of excess water. 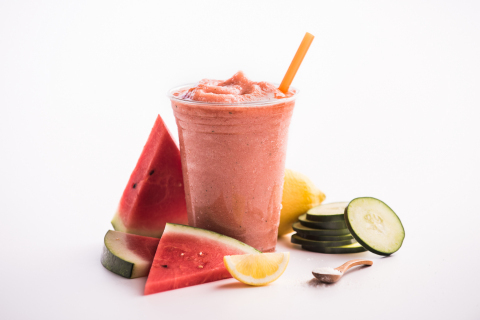 The Poolside Fit™ smoothie is blended with watermelon and cucumber, for added hydration. "At Jamba, we're focused on providing our guests with high quality solutions to feel and look their best. Our new Poolside Fit™ and Watermelon Breeze™ smoothies offer a balance of intense flavor, whole-food nutrition, and fun. I'm also excited to introduce a collagen boost to our menu - it's a simple way to add even more benefit to your favorite smoothie," said Laurie Winward, VP of Culinary Innovation at Jamba Juice. Both smoothies are available at Jamba Juice locations nationwide, and more information can be found at www.jambajuice.com.